When it comes to showing the monster, most adaptations of Beowulf play it close to the chest, holding off on revealing Grendel and his mother in full until somewhere around the halfway point. In addition to abiding by traditional horror-movie rules, this restraint also plays into the complex origins of the anonymously written epic poem. Since the text blends fantasy with legendary characters, mentions of actual events, and biblical allusions (Grendel is described as having descended from Cain), Beowulf leaves plenty of room for interpretation with its villains. For instance, maybe Grendel’s part of a dying line of Neanderthals, as hinted by his physical appearance in 2005’s Beowulf & Grendel. Maybe he and his mother are part of a bear-worshipping tribe of cannibals, as suggested by Michael Crichton’s Eaters Of The Dead and its film adaptation, The 13th Warrior. Or maybe Grendel’s more of a misunderstood half-human/half-creature than a full-blown monster, as posited by Robert Zemeckis’ motion-capture take on the Old English adventure. Whatever the case, keeping the antagonists hidden—at least for a little bit—encourages the viewer to speculate whether they’re historical, fantastical, or a mixture of both. ITV’s Beowulf (airing on Esquire in the United States) leaves no room for such ambiguity. In the very first scene, a flashback to Beowulf’s childhood shows him and his father galloping on horseback down the beach, pursued by two computerized trolls that look like a cross between goats and bears. They’re not of the Grendel clan—trolls are just a part of this world, as are giant lupine creatures called Barghests and a rabid lemur of a baddie that may or may not be Grendel himself. An eventual severed limb and the fact that Beowulf and the other characters refer to the beast as “Mud-Born” strengthen the connection to the main villain of the source material. To further drive home that their version of Beowulf is an unapologetic sword-and-sorcery fantasy, creators James Dormer, Tim Haines, and Katie Newman move the poem’s setting from Denmark to an imaginary realm called The Shieldlands. Even so, the production wisely filmed the fortress of King Hrothgar (William Hurt) just south of the rural English village of Eastgate, meaning the series’ Danes (er, Shieldlanders) still inhabit an environment hallmarked by mud, weatherbeaten hills, and iron-gray skies. And that’s the smartest move on the part of the creators: delivering fantastical occurrences with a realistic tone. While the creatures’ CGI is substandard across the board—even as their no-frills design looks appropriately born of the show’s drab, mucky world—the conflicts between the flesh-and-blood characters carry familial tension straight out of any network drama. Unlike the Beowulf of the poem, who arrives in Denmark as a mysterious hero to put an end to Grendel’s attacks on the Danes, Beowulf of the Shieldlands (Kieran Bew) is more of a prodigal son, adopted by Hrothgar and returning home after a long absence with his right-hand man, Breca (Gísli Örn Garðarsson), in tow. 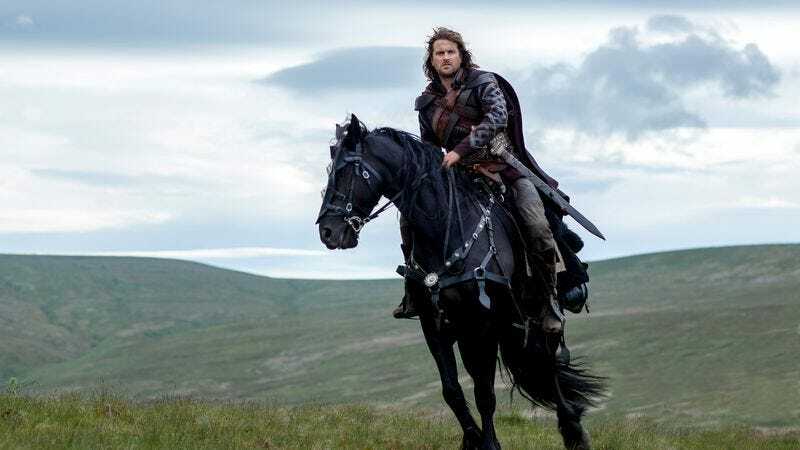 Once he gets there, he has to contend with his envious adoptive brother, Slean (Ed Speleers), and their mother, Rheda (Joanne Whalley, making a return to the fantasy genre after Willow all those years ago), who has taken the throne after Hrothgar’s death. Although the monsters are unquestionably monsters, they seem like afterthoughts when compared to the conflicts boiling between the human characters. Sometimes, that fantasy/realist balance feels a little too uneven. While each of Beowulf’s actors knows how to infuse emotional nuance into their high-fantasy stoniness, the action sequences—monster or otherwise—are often too quick and jostling to be satisfying when compared to the drawn-out brutality on a show like Game Of Thrones. ITV and Esquire could take a lesson from HBO in the pacing of its battles, not to mention the amount of blood and guts splattered across the countryside. As family-friendly as Beowulf is trying to be, a little bit of the red stuff goes a long way when adding some excitement to a fantasy epic, a TV market that’s admittedly become oversaturated since Game Of Thrones premiered back in 2011. Even the most cerebral series in the genre (which Beowulf certainly is not) should still appeal somewhat to viewers’ collective dragon brain, especially if it’s the kind of show that might have an actual dragon in its future. And after seeing those trolls bound across the sand less than 30 seconds in, Beowulf definitely seems like that kind of show.